The library's Spring Book Sale begins Saturday, April 6 . This is one of the Friends ’ major fundraisers of the year, and all proceeds benefit the library. So come on in and stock up for your summer beach reads! The sale runs through Sunday, April 14, and is open daily during regular library hours . 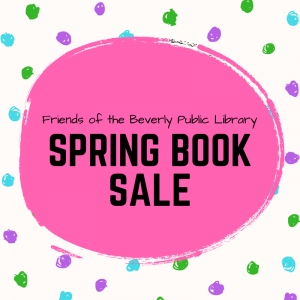 Members of the Friends of the Beverly Public Library are invited to a preview of the annual Friends’ Spring Book Sale on Friday, April 5 from 6-8 PM . Not yet a member of the Friends? No problem! You can join or renew at the door. The Friends of the Beverly Public Library is currently selling tickets to the May 5 Symphony by the Sea concert, “Broadway to Beethoven and Back” at The Cabot . Each ticket is $35, and includes a complimentary Friends membership for new members! Enjoy an afternoon of great music while helping raise money for the library’s teen renovation project . To purchase, visit the Circulation Desk at the main library. Cash and checks accepted. Questions? Contact Allison Babin, Assistant Library Director, at babin@noblenet.org or call 978-921-6062, ext. 2118. 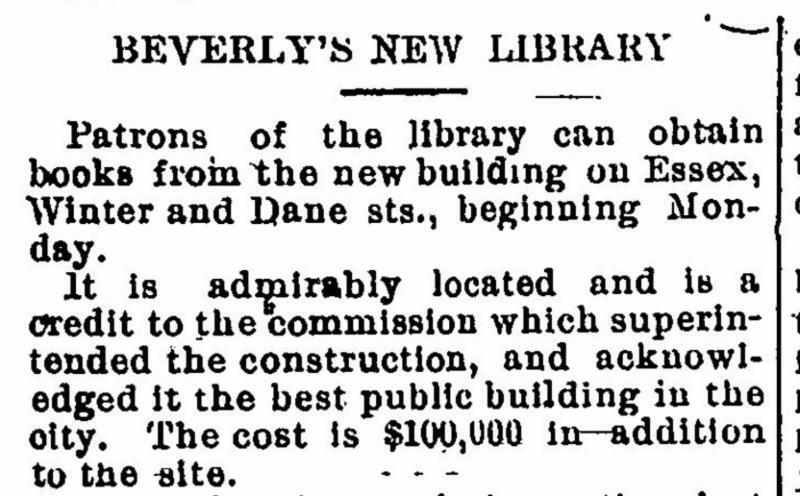 We are pleased to announce that the library has begun to digitize our historical Beverly newspapers . Early editions of the Beverly Citizen and Beverly Evening Times are now available from the Beverly History and Genealogy page. Articles can be searched, downloaded, cropped, highlighted, tagged, and printed. Questions? Contact Lisa at ryan@noblenet.org . Monday Mornings are in session! Please join us at 9:30 AM for the program; doors open at 9 AM for refreshments. 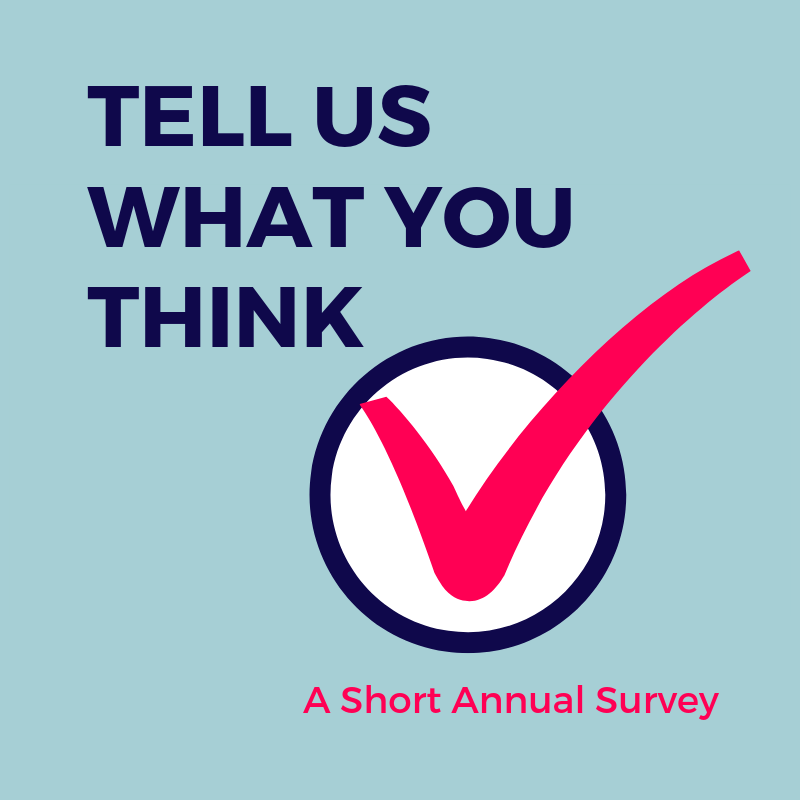 Would you like to take a course in astronomy, accounting, web development, aromatherapy, or something else? This class on Tuesday, April 16 at 10 AM will teach you how to use select online learning resources . Join us on Friday, April 26 at 1 PM for The Favourite . See why Olivia Colman’s killer, queer impression of the slightly mad, mostly sad Queen Anne won her this year’s Best Actress Oscar. 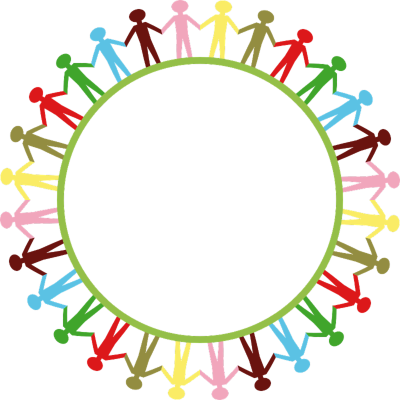 Weekly English practice groups on Fridays from 11 - 11:45 AM. For Adult English Language Learners of all levels. This month the main library welcomes an exhibit of artwork in a variety of media and styles by students in the art program at Beverly High School. The exhibit is free and open to the public during regular library hours, when community meetings or library programs are not in progress. For more info contact Meghan at karasin@noblenet.org or 978-921-6062, ext. 2130 or check the Teens page for upcoming programs, new books, and more! The library’s highly competitive Teen Poetry Contest received 507 entries this year! At this ceremony and reception, selected teen finalists will read their poems aloud, winners will be announced, and prizes will be awarded. Finalists and their families, participants in the contest, teachers, and all others, are welcome to attend. Join us for a night of excitement and amazing local poetry! A reception with refreshments in the Barnet Gallery will immediately follow the ceremony. Bored and hungry during school vacation? Come eat free pizza at the library while you watch Spider-man: Into the Spider-verse on our big screen! Read a great book, discuss it, and eat free pizza! Pizza Book Club is open to teens in grades 6-12, but is especially good for middle school. (BMS students: Ask your ELA or Reading teacher if Pizza Book Club can fulfill your independent reading requirement.) Pick up the book at the Circulation Desk on the 2nd floor of the library. For more info contact the Children's Room at 978-921-6062, ext. 2107. Spring Story Times are in session and run through the week of May 5 - check the Kids page for details. This interactive story time incorporates math and science with stories and activities. It is based on the What’s the Big Idea? program created by Mother Goose Programs of the Vermont Center for the Book. This program is for children ages 4-6. Join us for a new parent and child playgroup! Play and explore during this fun-filled hour of songs, stories, and family friendly activities. For families with children of all ages. All are welcome to sing, dance, play and learn! Presented by the CFCE of the North Shore. CFCE of the North Shore is funded by the Massachusetts Department of Early Education and Care awarded to the Peabody Public Schools. Visit the Kids page for MANY MORE fabulous programs! 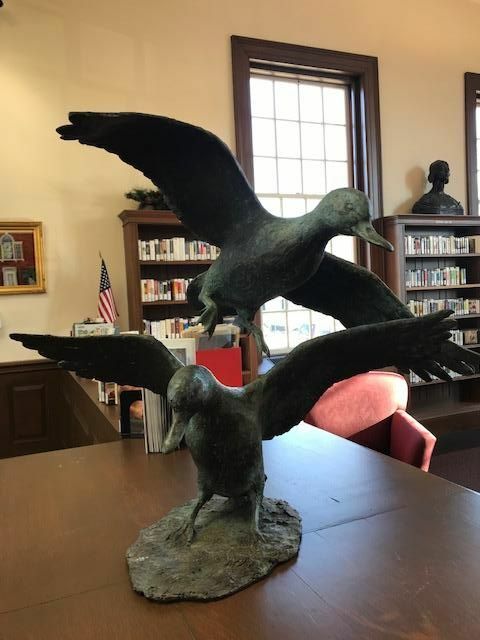 Please join us for a reception on Thursday, April 25 from 2-3 PM at the Farms branch to honor Renée Mary, a lifelong Beverly Farms resident and environmental activist, and to thank the donors who helped raise the funds to purchase the bronze sculpture “Coming In” in her memory. The sculpture was created by Beverly Benson Seamans and is located in the Seamans Room at the Beverly Farms Library . Refreshments will be served. Adult handicraft group meets the first Thursday of each month. The program is open to all who enjoy handwork or fiber arts. Bring your project, meet other crafters and share ideas. No instruction provided. This month, the pastel artwork of Michele J Kenna celebrating the seasons will be on display in the Conrad Room. Please join the artist for her opening reception on Thursday, April 4 from 4:30-8:30 PM, as well as an art demonstration in pastel on Thursday, April 11 from 10:30 AM-12:30 PM. Come see our new Teen Space and join in some Drop-In Activities celebrating Poetry Month and Earth Day! Join Dara for a lively, interactive music program. For children, ages 18 months-5 years and their caregivers. All are welcome. Join us for music and rhyme, rhythm, dancing and shaking, plus a parachute. For children 4 years and under and their caregivers. Spring Story Times run April 1-May 15 - check the Farms page for details. April Vacation Fun: Come on In! The Water’s Fine!